The horn section in the first day of Orchestra Orientation class, 2015. On the first day of the first full week of classes, Juilliard’s freshmen orchestral musicians began Orchestra Orientation. 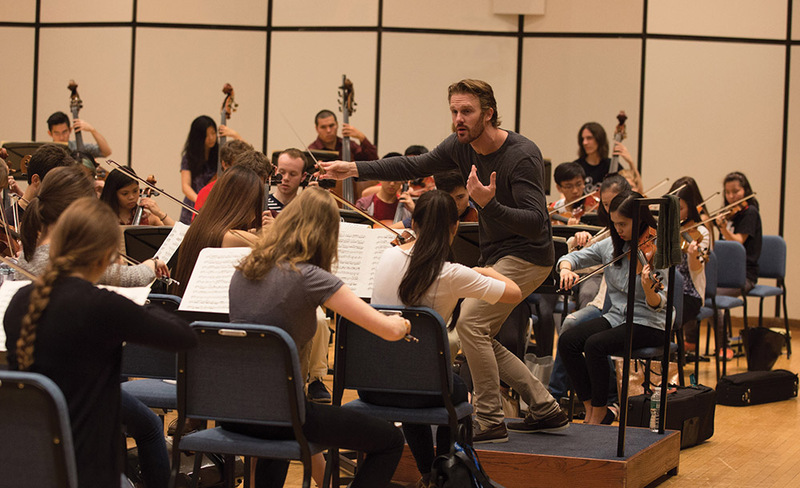 This unique program, now in its second year, was designed to prepare the first-time college class for the expectations and rigors of the Juilliard orchestral program. It takes place through the first three weeks of the fall semester and includes rehearsals, sectionals, seminars, and workshops all focusing on one work, Brahms’s Symphony No. 4. The piece—and much of the curriculum—was chosen by Alan Gilbert (Pre-College ’85, MM ’94, orchestral conducting), Juilliard’s director of conducting and orchestral studies and the music director of the New York Philharmonic. Belfast-born conductor Courtney Lewis, assistant conductor of the New York Philharmonic, led fledgling Juilliard Orchestra musicians through Brahms’s Symphony No. 4 on the first day of Orchestra Orientation. The first class began promptly at 9:30am, with the musicians beginning to tune—and soon learning from one of the faculty coaches who work intensively with the class, oboe faculty member Elaine Douvas (co-principal oboe, Metropolitan Opera), that the orchestra always tunes with three As, and that the Juilliard A is 441. Moments later, Courtney Lewis, the assistant conductor of the Philharmonic, stepped to the podium and started in, leading the group through the first movement without pause. After that a measure-by-measure dissection of the performance commenced with Lewis and the coaches. In addition to Douvas, faculty members Eric Bartlett (BM ’78, MM ’79; cellist, New York Philharmonic), Dan Druckman (Pre-College ’76; BM ’80; associate principal percussionist, New York Philharmonic), and Raymond Mase (principal trumpet, New York City Ballet Orchestra), plus Yulia Ziskel (MM ’00; first violin, New York Philharmonic), are working with the class. The hour-and-a-half-long rehearsal was followed by a panel titled Orchestra Rehearsals: Preparing Like a Pro, in which the coaches were joined by faculty member Blair Bollinger, longtime bass trombonist with the Philadelphia Orchestra. They answered student questions and dispensed advice about what they wished they’d known when they were students—and the secrets to thriving with classmates with whom the students could well be working for their entire careers. Two intense weeks of rehearsals, seminars on orchestral etiquette and mock auditions later, the class would culminate with Alan Gilbert conducting the ensemble in the Brahms Fourth. A few of this year’s and last year’s participants talked about the class shortly after it began. Alice Ivy-Pemberton, a Kovner fellow, is a first-year violinist. The first day of Orchestra Orientation has changed my perspective on what it means to be a Juilliard student. After two weeks of getting to know everyone, the first notes of Brahms carried me into a different world of music making and it was a true joy to play together after all of the time, effort, and name-learning that the previous weeks required, and to connect with my new friends in a different way. There was a clear expectation of professionalism in the class—training that I know will be invaluable for all of us. The speed and rigor surprised me—my favorite moment the first day was when the conductor sprang onto the podium at the beginning of the rehearsal and barely blinked before beginning the first movement. I couldn’t help but feel the rapidity mirrored our new life at Juilliard. Second-year violinist Fedor Ouspensky (Pre-College ’12), who holds Bidù Sayão and Michael and Ethel Cohen scholarships, took the Orchestra Orientation class in its inaugural year. I took the class last year, and it was great—you start right away with the top-notch conductor coming to you. One unique part of it was that it was the first time I’d gone to orchestra rehearsals and not ever performed the piece in concert that we rehearsed, but that kind of took the pressure off of playing under Alan Gilbert and let us concentrate a lot on different aspects of orchestra playing. I also enjoyed when musicians from the New York Philharmonic gave us coachings about playing in a professional orchestra and what their standards are. Juilliard clearly wants the Juilliard Orchestra to stretch and rise to that level by re-creating that environment. We learned all sorts of things, especially that you can learn a lot from listening. Looking up from your music stand and listening was the motif of the class. We also learned that the musicians in the back have to play a tiny bit earlier or sometimes louder—in the back we deliver the sound and the power. If you’re thinking individually rather than collaboratively, you can do it, but it’s a lot harder. Second-year master’s student Doori Na (BM ’13, violin) is one of six mentors working with the Orchestra Orientation class. In the year between getting his bachelor’s and starting his master’s he gigged with Orpheus and the American Ballet Theatre orchestra. Irene Diamond Graduate Fellowship as well as Starling Foundation and Dorothy DeLay scholarships. When I was an undergrad at Juilliard [before Orchestra Orientation class existed], we were just in orchestra with all the upperclassmen, which was nice in a different way if you have good older peers who were taking it seriously, but it meant you did miss out on learning some small things. For instance, this morning I saw the outside person turning the page instead of the inside person. Another piece of advice I gave this morning was, if you’re messing up a spot, you should make a tiny circle or mark in the score so you can get back to it. Plus a lot of Juilliard freshmen haven’t necessarily done a lot of orchestra before, and I think this class will definitely give them a better respect for it. Sometimes freshmen have the stereotype that [in orchestra] you’re a robot and the conductor is a tyrant, so I think part of my job as a mentor for the class will be to inspire people. You have to know the notes, of course, but aside from etiquette, energy is the biggest part. You almost have to apply the same type of energy you would to solo playing to playing in the orchestra, and then you can really have fun with it.